The former governor of Kano State, Senator Rabiu Kwankwaso, has formally declared his intention to run for the presidency in the 2019 general elections. 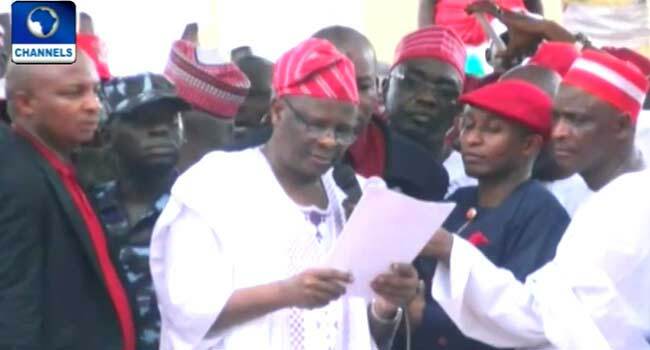 Senator Kwankwaso declared his intention to contest for the poll on the platform of the Peoples Democratic Party (PDP) while addressing a crowd of supporters on Wednesday in Abuja. He accused the present administration of not living up to expectations of the people, stressing that the All Progressives Congress (APC) has failed in its campaign promises. “Today I declare that I am going to vie for the office of the President of the Federal Republic of Nigeria under the platform of the Peoples Democratic Party. I stand on my honour to offer a paradigm shift in leadership,” he said. “There is no gainsaying that all is not well with the polity. It is also clear that the same mindset that created and escalated the problems cannot be used in resolving the ongoing crisis in our nationhood and national development”, the lawmaker added. Senator Kwankwaso also called on Nigerians to vote for change which he said the PDP would bring in 2019, noting that his intention was to offer positive changes to the nation. He promised to provide an equal Nigeria where people from different tribes would be seen as one, as well as to increase education among the youths. “I want to lead a Nigeria where people are educated and exposed beyond the confines of their tribe, religion, linguistic group or place of birth,” he added.